Roggvir, a Nord warrior, is a citizen of Solitude who worked as a city guard. According to his sister Greta, he opened the city gates to allow Ulfric Stormcloak into the city when he first came with the hidden intention of challenging the then-High King Torygg. After Ulfric killed Torygg in the challenge, he tried to escape the city, and Roggvir again opened the gate for him. Accounts of the incident vary wildly among the citizens; most claim that he was an accomplice in the murder. Greta believes that he was doing his job, and had no way of knowing what Ulfric had done. 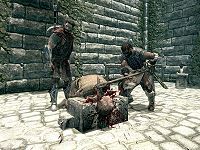 Upon entering Solitude for the first time, Roggvir will be publicly executed near the main gate. With his final words, he justifies Ulfric's killing of the king, stating that the challenge was posed and conducted in accordance with Nordic tradition, and therefore was not a crime. After the execution has taken place, an Amulet of Talos can be looted from Roggvir's corpse, which can be returned to Greta in the quest Return to Grace (see bug). 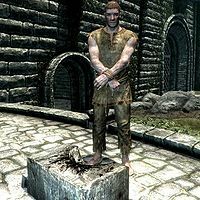 He wears a roughspun tunic and prisoner's cuffs. Captain Aldis: "Lock the city gate." Vivienne Onis: "Cut em [sic] down!" Captain Aldis: "Guard. Prepare the prisoner." Captain Aldis: "Very well, Roggvir. Bow your head." Roggvir's death is scripted, making it impossible to save him. If you start a fight with the guards and Roggvir survives for too long, he will be teleported to a test room and be killed by the resident NPC. If you enter Solitude for the first time through the side gate, you will hear the execution taking place, but you may miss seeing it if you don't head over to the main gate in time. Regardless of whether or not you see it, dialogue options with NPCs will appear as if you had witnessed the execution. After the Battle for Solitude, the Stormcloak soldiers will have different dialogue about Roggvir's death depending on whether or not the city was visited before starting the quest. Though he says he is going to Sovngarde, he does not appear when you visit it. If you never come to Solitude until after the Battle for Solitude, he will still have been executed prior to the Stormcloaks taking over. Picking up the amulet before receiving the quest may make the quest uncompletable, as well as marking the amulet as a quest item. If this happens, you will be unable to drop the amulet, and any further amulets of Talos you pick up will stack and add weight. This can be avoided by waiting to loot Roggvir's body until you are directed to (although you still get no reward from the quest). If all else fails, killing Greta will end the quest, allowing you to drop the amulets. Alternatively, you may simply use the console command "stopquest SolitudeFreeform03". Killing Roggvir during his execution does not incur a bounty, but guards and other NPCs will attack the player indefinitely in Solitude. If you never come to Solitude until after the Battle for Solitude, you will not witness his execution, but dialog from NPCs will still act as if you were there when it happened. ? This page was last modified on 10 September 2017, at 23:42.